One of the most time consuming and detail oriented things that I do in my company (Fearless Social) is launching products to the public. Even after launching hundreds of digital products over the past 5 years, I still sometimes wake up a night thinking that I forgot to do something whenever we launch a new product. There are hundreds of tiny little details and tasks that have to be tended to whenever you launch a product. It can be absolutely exhausting. 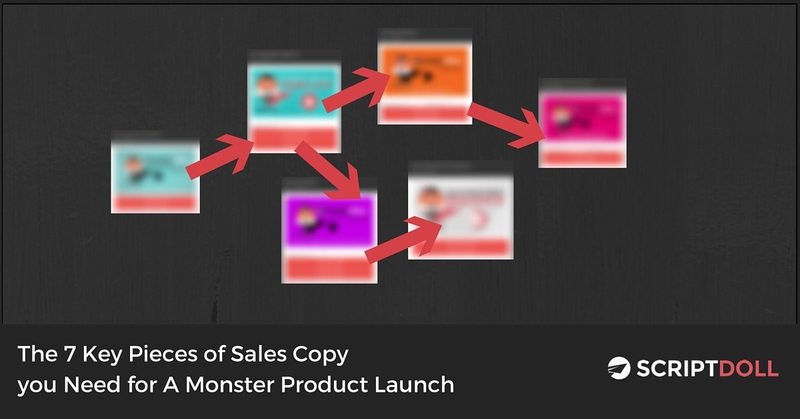 In this blog post, I’d like to give you a step-by-step walkthrough of the 7 pieces of sales copy you must write for your product launch and How to Write Them All in About 10 Minutes (seriously). The affiliate invite page is a vital part of any product launch. This is the page that is going to let your affiliates know everything they need to know about promoting your product. The affiliate invite email sequence comes in handy when you have an existing email list of past affiliate partners. The Affiliate Invite Email Sequence is designed to get them to your affiliate invite page and get them excited about your upcoming product launch. There is nothing quite as powerful as written long form sale copy. Video Sales Letters are powerful (and we’re going to use one on this page too), but people want to text when visiting a sales page. The text base sales letter is important because it allows easy scanning of an offer. If you want to instantly increase your conversions on a written sales letter you need to include a video sales letter (VSL) that compliments it. This isn’t something most people are good at writing, but once you master it, it takes your written sales letter to an entirely new level (and something we built into the ScriptDoll software to do automatically). This video is typically placed right below the main headline on a sales page. A good upsell sales letter contains minimal written sales copy but what is there is important. You don’t have to include all of the information that you did on the main letter because you’ve already covered it main sales page. The key to a good upsell is to be brief but convey why someone should upgrade from their original offer. An Upsell Video Sales Letter (VSL) is important for the same reason that it was important on the main sales letter. A video sales letter allows you to bond more with a person visiting your sales page and increases conversions if done correctly. Once you have your main sales letter written you need a way to communicate your offer to your existing customer base. You also need email swipe to give to your affiliates and joint venture partners. If you’re a ScriptDoll Subscriber you already know how quickly you can write your sales copy using the ScriptDoll Copy Engine. We wanted to make it even easier to create everything that you need to launch your product. That’s why we created the Digital Product Launch Recipe. This is a set of ScriptDoll scripts that can be bound together to write everything you need fast. Not a ScriptDoll User yet? Click the Banner Below to Get Started Now. The infographic below shows you exactly which scripts you need to use to create all of the 7 pieces of sales copy fast. This allows you to get your launch sales copy created fast. Want to Download this ScriptDoll Recipe? Click Here. Want to See the Full Walkthrough of this ScriptDoll Recipe?